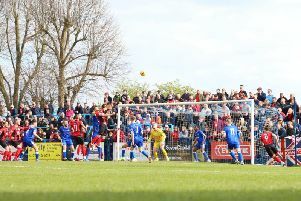 Assistant-manager Mitch Austin believes Kettering Town will get an early indication of what lies ahead for them when they kick-off the new season at Slough Town on Saturday. The Poppies make the trip to Arbour Park knowing they will be up against one of the teams who are well-fancied to push for promotion in the Evo-Stik South League Premier having lost out in the play-off semi-finals last season. But Austin, who was appointed as number two to Marcus Law over the summer, insists Kettering have aspirations of being at the top end of the table themselves. Having made a number of summer signings, the Poppies finished pre-season well with three wins in a row including a 5-0 success at Evo-Stik League Premier side Rushall Olympic last weekend. And Austin now expects plenty of “hard work” from the squad as they bid to get off to a good start. “We are definitely ready for Saturday, we are looking forward to it and we are excited about starting the season,” the assistant-manager said. “We finished with a good win at Rushall and now we will be ready to work hard in what will be a tough game. “It’s a hard first fixture and I think we will have a clear idea of where we are after the weekend. “We have worked hard on a lot of things and we are going there with plenty of confidence. “We will be going there with the intention of coming out of the game with the right result. The Poppies will be without last season’s top scorer Aaron O’Connor who starts a three-match ban, which rules him out of the first week of the campaign. But Rene Howe will be available having escaped with just a one-friendly suspension after he was sent off in the 3-0 home defeat to Barwell during pre-season. “It’s good news for us that Rene is going to be available,” Austin added. “He is a key player for us and if we had been without him as well as Aaron then it would have been a big blow. But he has served his ban and it will be good to have him involved."